California Democrats know exactly the trouble they’re in: They have too much of a good thing. Competitive congressional districts across Southern California are packed with qualified, enthusiastic and well-financed candidates touting progressive policies and promising stiff resistance to President Trump’s agenda. The only problem: there are too many of them. In Huntington Beach, eight Democrats are on the ballot to unseat Republican Rep. Dana Rohrabacher. Inland, another six are competing to replace Rep. Ed Royce, who is retiring at the end of this term. And in Rep. Darrell Issa’s seat, also soon to be vacated, four political newcomers are hoping to turn the seat blue. It’s now too late to back down. With no clear solution in sight and the primary less than three weeks away, this could cost the Democratic Party its opportunity to retake the House of Representatives in 2018. That “nightmare scenario” for the party comes via the state’s “top two” primary, which places all candidates on the same ballot, regardless of their party, and only allows the first- and second-place winners to advance to November’s general election. 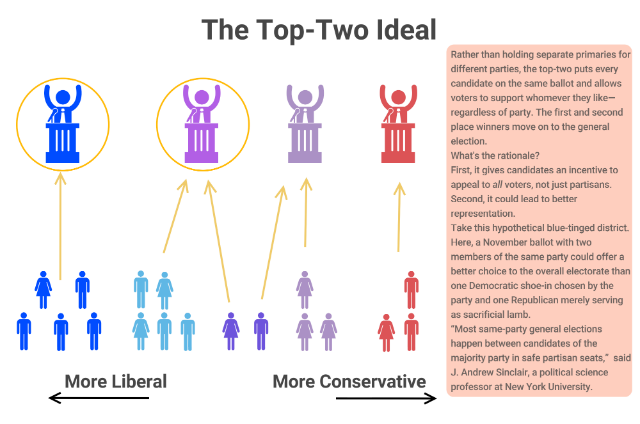 Top-two was supposed to temper polarized partisanship and favor moderates. 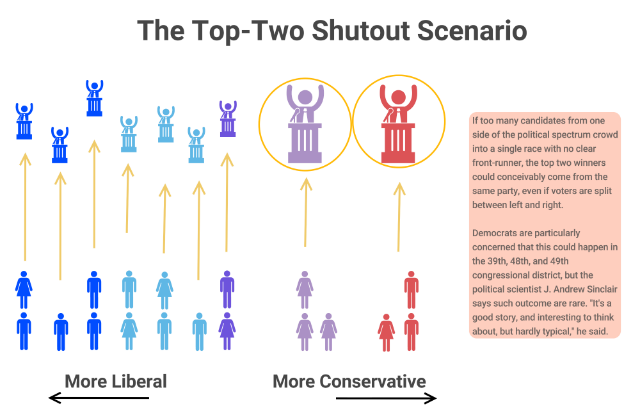 But it does have this quirk: If too many candidates from one edge of the political spectrum enter the same race without a clear frontrunner, they risk splitting their side of the vote, canceling each other out, and handing the top two spots to the opposition party. Such an outcome could befall at least three of the most competitive congressional districts in California—all of them in and around Orange County. Democrats need to flip 23 seats nationwide to retake the House, and have hopes for seven California districts now held by Republicans that Trump lost in 2016. What can the party do? The state party tried winnowing the field by endorsing. The national Democratic Congressional Campaign Committee publicly backed a few of its favorites. Super PACs are now showering Southern California with wily attack ads that hammer local Republicans for being too liberal. The question is: will any of it work? It’s not like Democrats haven’t been warned. At the party’s annual convention in February, party chairman Eric Bauman warned delegates of the pending “overpopulation problem” in certain congressional races and pleaded with longshot candidates to gracefully step aside. The party also attempted to offer endorsements in various races, hoping to single out individual candidates in each race. In February, Democratic delegates were too split to offer their seal of approval in some of the most contentious legislative and congressional races—the very contests where the seal of approval could have been most valuable. In the race to replace Issa, for example, party activists surveyed the field of progressives: Would it be Mike Levin, the environmental lawyer and fundraising juggernaut? Doug Applegate, the Bernie-backing retired Marine colonel? Sara Jacobs, the millennial supported by Emily’s List or Paul Kerr, the real estate investor who came from hardscrabble beginnings? The party offered a collective shrug. Ditto in the crowded contests for governor and U.S. Senate. In the contest for Royce’s congressional seat, that lack of cohesion led to outright intraparty warfare between Democrats Gil Cisneros and Andy Thorburn culminating in a bizarre disagreement over a mysterious voice message. This week, the state party interceded, announcing a truce. “The opportunity to win this seat is too important for the two leading Democrats to squander it by focusing our fire on each other,” the campaigns said in a joint statement. Not that the G.O.P. has had much more luck in corralling its field. 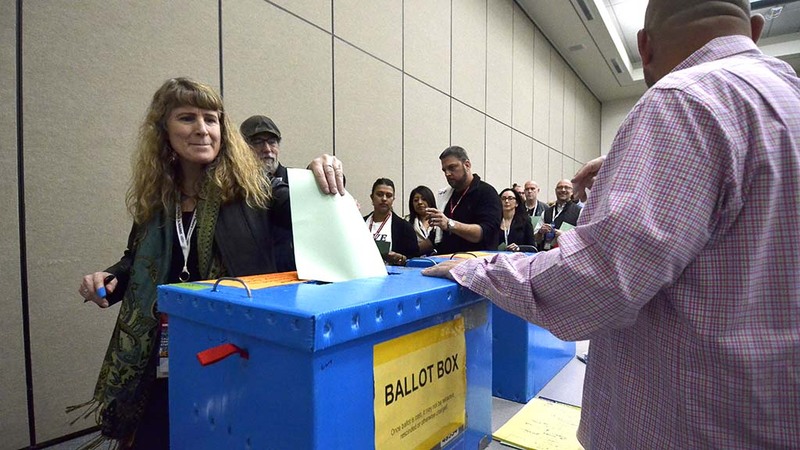 At their own party convention this month, Republican delegates also failed to formerly back either of their top candidates running for governor, businessman John Cox and Assemblyman Travis Allen. If that results in a Republican shutout at the top of the ticket, that could depress conservative turnout, dampening GOP electoral prospects across the state. But even where state party members were able to come together around one candidate, theirs is but one endorsement among many—and things are getting muddled. In southern Orange County race for Rohrabacher’s seat, the party endorsed stem cell researcher Hans Keirstead. But last week, the Democratic Congressional Campaign Committee, the party’s national campaign arm for House races, decided to back Keirstead’s chief Democratic rival, Harley Rouda, an Orange County real estate investor. Other influential elected officials and interest groups are similarly split in that race: Keirstead has the backing of three Democratic members of Congress, while Rouda has eight; Keirstead is supported by the Service Employees International Union in California, while Rouda has the backing of the largest California nurses’ union. With only one well known Republican running against Rohrabacher, former Assemblyman Scott Baugh, the district is among the most likely to result in a Democratic shutout. Absent a clear signal from the party establishment, Democrats’ strategy also includes attacking Republicans. Since the beginning of May, the DCCC has spent over $1.8 million assailing GOP candidates in the three contested Southern California races in an effort to elbow them out of a top-two spot. One of those targets is Republican Bob Huff, the former state senate minority leader and one of 17 candidates hoping to replace Royce, who is retiring from his Fullerton seat at the end of this term. The DCCC is now running an attack ad against Huff from the right—“he huffs and he puffs, but would make your taxes go up.” Two Democratic Party-affiliated political action committees followed suit with their own spot, painting the Republican as a tax-happy moderate. Huff calls both ads “ludicrous” and, given his conservative political leanings, “ironic.” But he says they aren’t unexpected given California’s election rules. This week, national Democrats also launched ads against Shawn Nelson, another Republican running for Royce’s seat. A third Republican in that race, former Assemblywoman Young Kim who has led many polls, has so far been spared from the Democratic onslaught. If the ads can drive the bulk of conservative-leaning voters behind a single Republican candidate, that would leave one slot open for a Democrat. In traditional partisan primaries, Democrats wouldn’t need to worry about Republicans at all. But the top-two system takes political parties out of the equation entirely, leaving an electoral free-for-all.